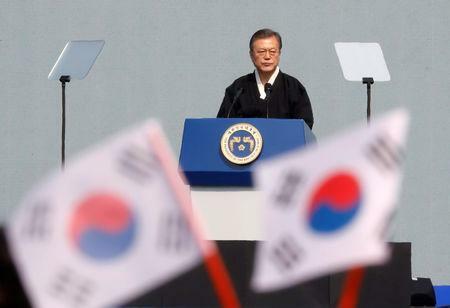 SEOUL/HANOI (Reuters) - South Korea will work with the United States and North Korea to help them reach a denuclearization deal, South Korean President Moon Jae-in said on Friday, a day after a U.S.-North Korean summit collapsed over a disagreement on sanctions. The second meeting between U.S. President Donald Trump and North Korean leader Kim Jong Un, in Vietnam, was cut short after they failed to reach a deal on the extent of sanctions relief North Korea would get in exchange for steps to give up its nuclear program. Moon has been active in efforts to end confrontation on the Korean peninsula, meeting Kim three times last year and trying to facilitate his nuclear negotiations with the United States. "My administration will closely communicate and cooperate with the United States and North Korea so as to help their talks reach a complete settlement by any means," Moon said in a speech in Seoul. Moon also said Seoul would consult Washington on ways to resume joint projects with North Korea, including tourism development at Mount Kumgang and the Kaesong industrial complex, both in North Korea. Both the United States and North Korea have said they intend to continue talks, but have not said when a next round might take place. In a move that could encourage more talks, U.S. officials said on Friday the United States and South Korea are expected to announce that they will not carry out large-scale spring joint military exercises, replacing them with smaller-scale drills. The allies suspended a number of military drills before and after the first Trump-Kim summit last year to encourage talks with North Korea, which denounced the exercises as training for invasion. Trump has repeatedly complained about the expense of the exercises and did so again after the Hanoi summit. Trump and Kim first met in Singapore last June and agreed to establish new relations and peace in exchange for a North Korean pledge to work toward complete denuclearization of the Korean peninsula. Trump said two days of talks in Hanoi made good progress but it was important not to rush into a bad deal. He said he had walked away because of unacceptable North Korean demands. "Basically, they wanted the sanctions lifted in their entirety, and we couldn't do that," he said. On Friday, Trump tweeted that the negotiations with Kim were "very substantive" and that "we know what they want and they know what we must have," but he gave no other details about any next steps. "Relationship very good, let’s see what happens!" the post said. North Korean Foreign Minister Ri Yong Ho said after Trump left Hanoi that North Korea had sought only a partial lifting of sanctions "related to people's livelihoods and unrelated to military sanctions." He said it offered a realistic proposal involving the dismantling of all of its main nuclear site at Yongbyon, including plutonium and uranium facilities, by engineers from both countries. While North Korea's official media said Kim and Trump had decided to continue talks, its Vice Foreign Minister Choe Son Hui has struck a more negative tone, telling reporters Kim "might lose his willingness to pursue a deal". "It occurs to us that there may not be a need to continue," she said, adding that North Korea had taken "many steps" to try to reach a deal. "We're doing a lot of thinking," she said while adding that the situation would change "if our demands can be resolved." U.S. Secretary of State Mike Pompeo told a news conference in Manila the U.S. side was "anxious to get back to the table so we can continue that conversation that will ultimately lead to peace and stability, better life for the North Korean people, and a lower threat, a denuclearized North Korea." And North Korea's state news agency was conciliatory, quoting Kim as expressing gratitude to Trump for putting in efforts to get results and calling their exchanges constructive. It made no mention of the breakdown of the summit. Failure to reach an agreement marks a setback for Trump, a self-styled dealmaker under pressure at home over his ties to Russia and testimony from Michael Cohen, his former lawyer who accused him of breaking the law while in office. While some credited Trump for refusing to be drawn into a bad deal, he was criticized for praising Kim's leadership and saying he accepted his assertion that he had not been aware of how an American student who died after 17 months a North Korean prison had been treated. On Friday, the parents of Otto Warmbier blamed Kim's "evil regime" for his death. Trump stressed that the North Korean leader had agreed to maintain his moratorium on nuclear and ballistic missile tests. A U.S. State Department official said the North Korean media coverage had been constructive, indicating both sides felt there was "ample opportunity" to continue talks. The U.S. official said North Korea had proposed closing part of its Yongbyon nuclear complex in exchange for lifting "basically all" U.N. sanctions except those directly targeting its weapons programs. The U.S. side said "that wouldn’t work", he said, adding that North Korea was unwilling to completely freeze its weapons programs. "So to give many, many billions of dollars in sanctions relief would in effect put us in a position of subsidizing the ongoing development of weapons of mass destruction," said the official, who spoke on condition of anonymity. The United Nations and the United States ratcheted up sanctions on North Korea when it conducted repeated nuclear and ballistic missile tests in 2017. Washington has demanded North Korea's complete, verifiable and irreversible denuclearization before sanctions can be lifted, a position Pyongyang has denounced as "gangster like."